It's the first round of the NBA playoffs, and a good series is kind of like finding a good mechanic you trust, but we've got it in Denver-Golden State. Nuggets-Warriors is the best series going and it isn't even close. Both the Celtics and Lakers are decimated by injuries and while the idea of a good Knicks team is certainly something to watch, neither series has a hook. For instance, the Lakers aren't losing to a young, upstart team with a changing-of-the-guard feel to the series. The Lakers are just old, injured and not very good. Ditto Boston. The Clippers-Grizzlies series is OK; dunks are surely fun to watch. I am vaguely aware of a series involving teams from the midwest and southeast? And the Miami Heat have a first-round bye. None of this is to say Nuggets-Warriors is the best series by process of elimination, these are just the facts as we find them. 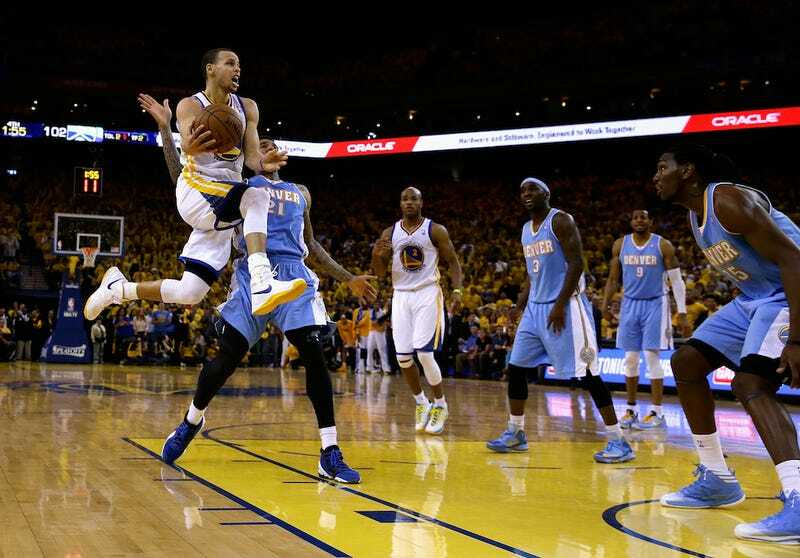 Last night into early this morning, the Warriors beat the Nuggets 110-108 in a wildly entertaining offensive showcase. The Warriors were down by as many as 13 in the third quarter when Stephen Curry and Jarrett Jack decided they weren't going to miss any shots. Curry was his usual deadly self from outside (and later hit a pair of ridiculous floaters in the fourth quarter) as he controlled the offense and whenever Jack got his hands on the ball he was successfully reminding us all that he was on the floor, too. It was like watching a very high stakes game of HORSE. Every time Curry did something there was Jack answering. Usually it's guys on opposing teams getting into a dueling match, but last night Golden State went on a 16-2 run to overcome a 13-point deficit and take the lead thanks to an intra-squad game of oneupmanship. That would be interesting enough, but they also did it in such spectacular fashion. Curry's shot is so pure that it is visually jarring when it catches rim and for every turnover Jarrett Jack made (there were seven), he willed Golden State through that third quarter. And of course there is Denver. Whether it's JaVale baiting Bogut into a technical foul, Iguodala ho-humming his way to a reverse alley-oop or Ty Lawson darting for the basket and contorting himself into layup after layup, the Nuggets are just as entertaining. Really, the only problem with this series is that it's a first-round matchup and one of these teams won't be around after next weekend.